As in past years, the club will be sponsoring a group of local children to attend the Nutcracker at Spreckle’s Theatre. After the performance, Santa Clause will be in attendance handing out gifts purchased by the club. Gifts will be wrapped during the December 4th weekly meeting. Come to the meeting and help wrap presents for the upcoming Nutcracker Program. There will be food and eggnog served. Bring a good pair of scissors and some tape. Write something funny or inspiring and leave it for someone to find (in a library book, in the office copy machine, etc. Carrie Ludtke introduced our lone Visiting Rotarian today, retired public safety officer and today’s speaker and trainer, Wulff Reinhold. With eight guests of Rotarians attending today’s Rotary Club meeting, Carrie Ludtke began today’s introductions. A big job but somebody has to do it, and Carrie did it perfectly. Teray McBride was the guest of AJ Printing (Greg Johnston); Rotarian Darren Elliott introduced his guest, attorney Theresa Fritz, with the remaining guests invited by Steve Olson and Sam McMillan: From Elsie Allen High School—Grant Ermis from Elsie Allen High’s Ag School, Gayle Smith from the ag group at Santa Rosa High School, and Past President Steve Olson’s two guests from the Future Farmers from Santa Rosa High, Caroline Ballard and Brittney Kozenko. A hearty Rotary Welcome to all of today’s honored guests. Troy Ingold, formerly of the Fortuna Sunrise Club, was introduced by Jack Abercrombie. President Peggy presented the election slate of nominees for Officers and Board of Directors of the Rotary Club of Santa Rosa, reading off the names of the new officers for two-year term from 2014 to 2016 and calling for nominees from the floor. There being no further nominations from the floor, the slate of nominees was unanimously elected. Nominees for the Board of Directors’ two-year terms: Tim Delaney, Karen Ball, Tim Fawcett, John McHugh, and Bill Hatcher. Tim Delaney is becoming an old pro at running Rotary’s Raffle, calmly announcing that today’s Jackpot was only $40 shy of breaking $1,000, giving remarkably favorable odds of one in 25 for each of the holders of all those little red tickets. Left holding the lucky ticket was United Way’s Mike Kallhoff, whose luck ran off his “ road to riches” when he failed to draw one of the Jokers, leaving him with $10 in consolation cash. But the odds are excellent that we’ll be playing next week for a $1,000 Jackpot, at least. When a fellow Rotarian is introduced to participate in one of our club’s traditions, you never know if we’re going to hear a speech, listen to a presentation, or enjoy the musical talents of one of our members. 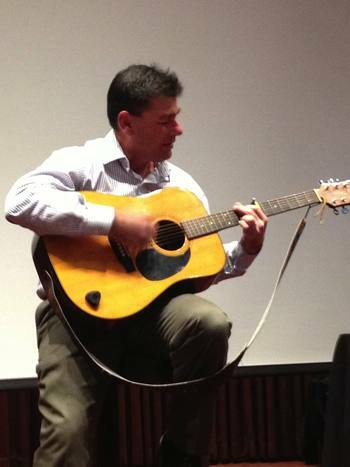 When Darren walked on stage with his guitar, we knew what was next—a musical craft talk from new member Darren Elliott. Seems like there’s a lot of that going around our Rotary Club lately. Great performance of your craft talk, Darren!! 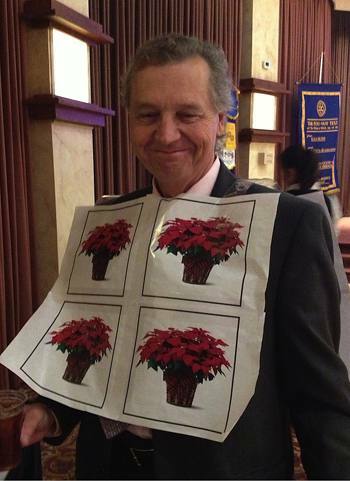 Additional Rotarians are encouraged to donate before the end of the year. Checks should be made payable to the Rotary Club of Santa Rosa Foundation and mailed to PO Box 1513, Santa Rosa 95402 or they can be given to Judy Glenn, Jeanne Levin, or Steve Olson at a Rotary meeting. You can also donate using PayPal through the Foundation page on the club website. One of the most enjoyable and rewarding volunteer opportunities every year has to be helping with the classic children’s adventure, the Nutcracker Suite Ballet. Held on Saturday afternoon at the Spreckles Auditorium in Rohnert Park., the performance is perfect holiday fun for our guests, disadvantaged school children, their parents and friends. Our fellow Rotarians will be wrapping gifts for the youngsters during our Rotary meeting on Wednesday, Dec. 4th, as we get ready for the ballet performance on Saturday afternoon, December 7th. Carrie Ludtke needs volunteer shoppers to shop for children’s gifts. Just give her call or email her to volunteer as a shopper and to prepare for Santa’s visit to the Spreckles Center after the performance, complete; complete with refreshments and lots of gifts and toys for the children. With only 10 days left before the performance, time is running out. If you would like to join us and the young children at the Nutcracker Ballet, contact Carrie Ludtke. Her contact information is in the Rotary Roster. Our Rotary Club’s first corporate members were officially welcomed to this 93 year-old Rotary Club. In coming weeks, track down Eric Goldschlag, Lance Badger, and Tom Schwedhelm. Introduce yourself and welcome them to Rotary. Rotary Clubs all over the United States—and the world—are sending Shelter Boxes to the storm-ravaged Philippines, including this Rotary Club’s World Community Service Committee, who voted to send a shelter box on behalf of our club. President-elect Mark Burchill caught us up to date on some housekeeping announcements: Effective January 1, the cost of lunch at the weekly Rotary meetings will be increased from $20 to $22 per person. Mark asked Rotary Club members if we wanted sandwiches for lunch every 4 to 6 weeks. Sandwiches won out in the informal survey. Sam McMillan announced that all of the meat from the County Fair has been delivered. Contact Sam to make arrangements to pick up what you bought. Christmas bell-ringing volunteers for The Salvation Army are needed for short two-hour shifts on the two weekends before Christmas: December 13 & 14 or Dec. 20 & 21. Contact Jock McNeill to sign up! Yale Abrams announced that several hands-on “Laguna Projects” will be coming up soon: Contact Yale to sign up. 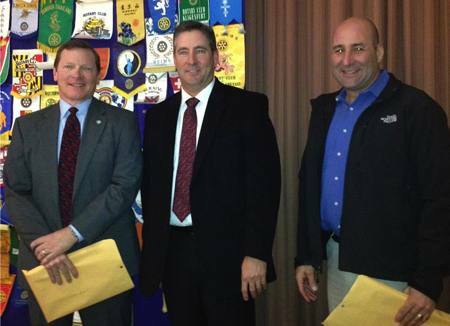 Rotary District 5130 now requires that all Rotarians who are involved with our youth and youth programs—even on a casual basis–receive specialized Youth Safety Training. 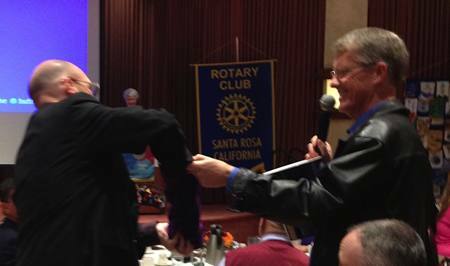 President Peggy introduced Wulff Reinhold, from the Rohnert Park-Cotati Rotary Club, a District trainer and retired policeman who devotes much of his time to Rotary for the District. Reinhold began by emphasizing that this training—required and enforced by Rotary International Policy—not only for the protection of our youth but to protect Rotarians, and others, who work and interact with young people. This marks the third year of the local compliance training in the District. The initial training concluded with all Rotarians in attendance signing that they had attended the training, with the reminder that this was only the initial training. Those Rotarians working with youth on a one-on-one basis would need even more training. Because of the cultural differences and boundaries that exist in these communities, Officer Reinhold emphasized the need for training at all levels and provided club members with contact information to enable all Rotarians who have contact with local youth workers receive the additional training.